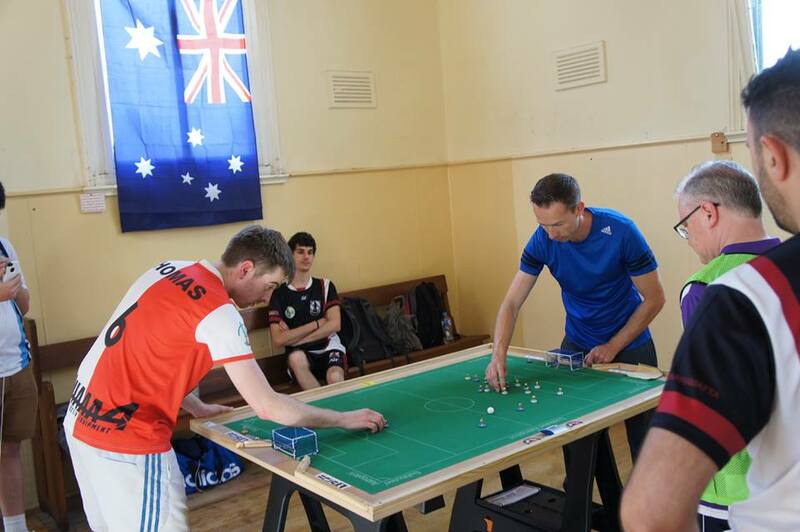 On Saturday the 10th of October 2015, the second edition of the Melbourne Open was held after a successful first edition in 2014 which saw Peter Thomas claim the title. This year the event had been upgraded from the status of a FISTF ‘Satellite’ to an ‘International open’ meaning more ranking points were on offer and that a player with any ranking position was able to compete. 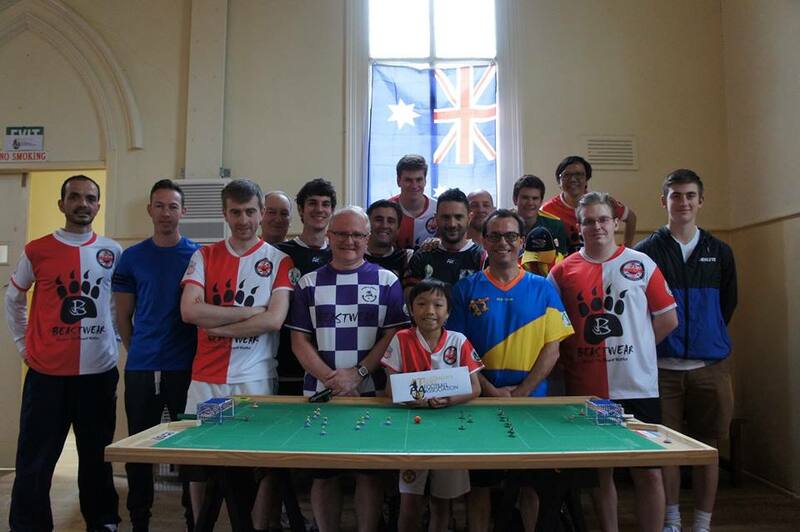 17 Players contested the event with players coming from 5 clubs and 4 nations and a high standard of play was ensured at the Brighton Church of Christ. In Group A Chris Thomas put on a master class to defeat Benny Ng (7-1), Luke Radziminski (5-0) and Julian Duszniak (7-0) which meant he progressed in 1st position. Both Luke and Benny had comfortable wins over new player Julian but with Benny scoring an elusive 8th goal in the final minute of his match against Julian, it meant a draw would be enough for Benny in the group’s finale. Sure enough, the match between Luke and Benny finished all square at 1-1 which meant Ng- the Singaporean International progressed in 2nd place. Group B looked to be the group of death after the Thursday night draw, and even after David Simpson unfortunately had to pull out due to sickness, there were still close matches expected between Peter Thomas (mel), Benji Batten (mel), Daniele Lombardi (par) and Dillon Izon (mel). In the early matches, Dillon proved again that he can not hold a lead after going down late to Daniele (2-1) and Benji displayed some shooting prowess in a high-scoring loss to the seeded player Peter Thomas (4-7). Benji then proceeded to dismantle Dillon (6-0) with Peter beating Daniele 2-0 in a very tight encounter. These results meant the final game between Benji and Daniele would decide 2nd position. Daniele dominated the first half but with some Manuel Neuer-esque goalkeeping, Benji held himself in the game. Five minutes into the second half the young Melburnian took the lead and after a triumphant celebration, attempted to hold on for the remainder of the match. Daniele equalized with 5 minutes from time though unfortunately he couldn’t find a late winner meaning Benji would progress on goal difference. 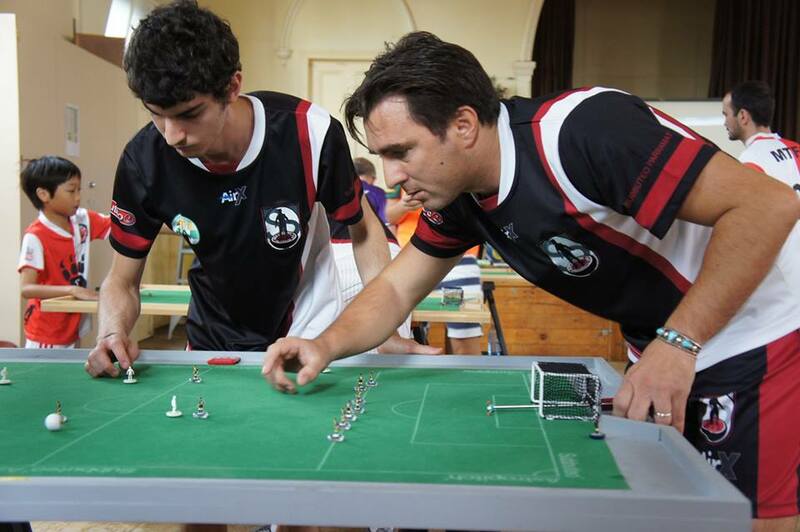 Rik Bland defeated Giuseppe Tardiota 1-0 in the Brisbane derby in what proved to be the crucial game in Group C where the Brisbane players were joined by Eliot Kennedy, Benjamin Ng and Vincenzo Coco of Italy. Eliot Kennedy rose to the top after notching up 4 wins with 17 goals with Rik following closely on 9 points. All players in this group finished with points after young Benjamin drew 0-0 with Vincenzo in a close match. 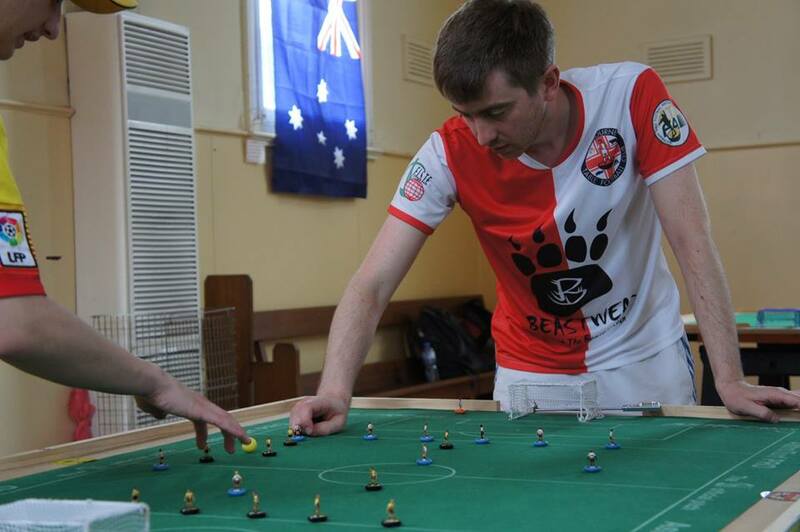 The Brisbane Derby in Melbourne! 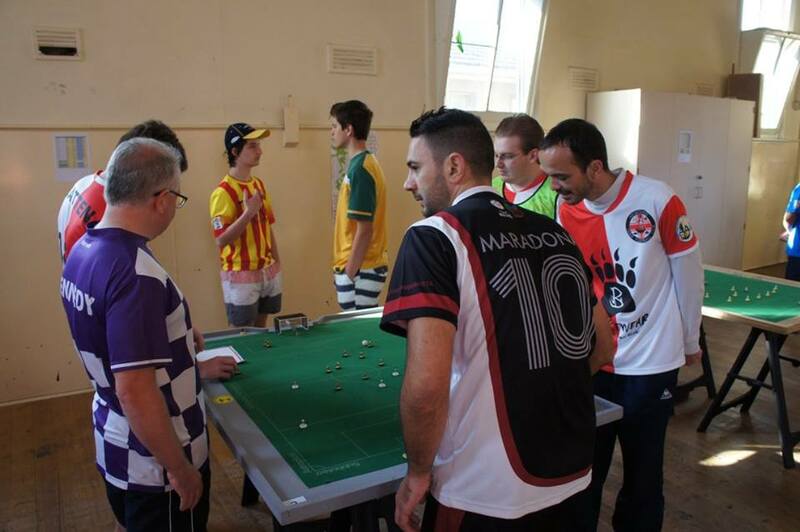 Group D was a battle of the Italian-Australian heavyweights from Subbuteo Parramatta with Raffaele Lombardi and Fabrizio Coco battling for top spot. After their very tense encounter finished 0-0 with neither player wanting to risk conceding a goal, it was left to goal difference to split these players. Both players notched 6-0 wins over Alexandros Stefanos but Fabrizio put two more past Chris Garagounis to finish on top. 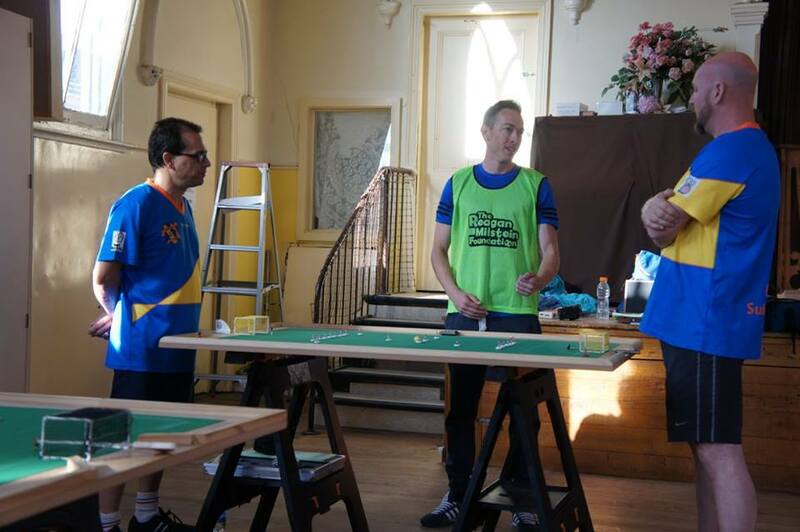 The closing game between Alexandros and Chris finished 0-0 meaning again all players took points. The Quarter-Final stage proved to throw up the most exciting matches. 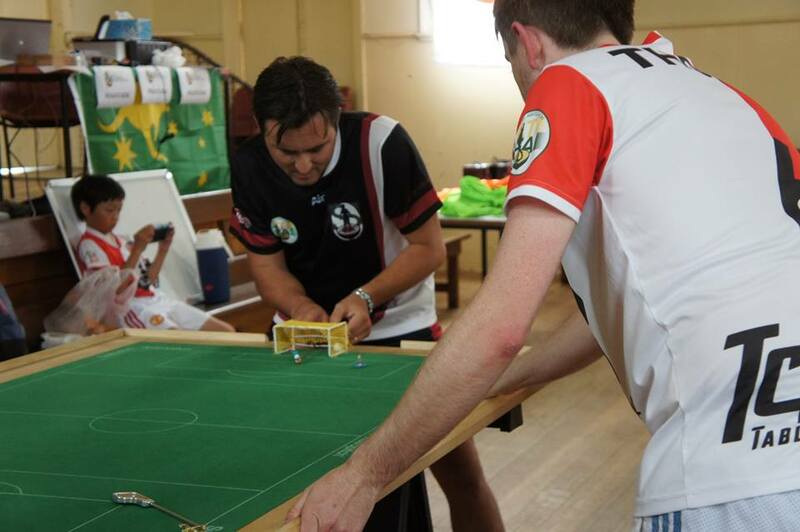 Rik Bland had his run cut to an abrupt halt by Chris Thomas who was finding his stride (9-0) whilst Eliot Kennedy brought his goal tally up to 20 with a 3-0 win over Melbourne’s Benny Ng. Farbizio Coco also booked his ticket to the semi’s with a 2-0 win over Benji Batten in a very close game with 2 late goals proving the difference in a game played in fantastic spirit. The last quarter-final deserves a paragraph of its own as it turned into the game of the Tournament. 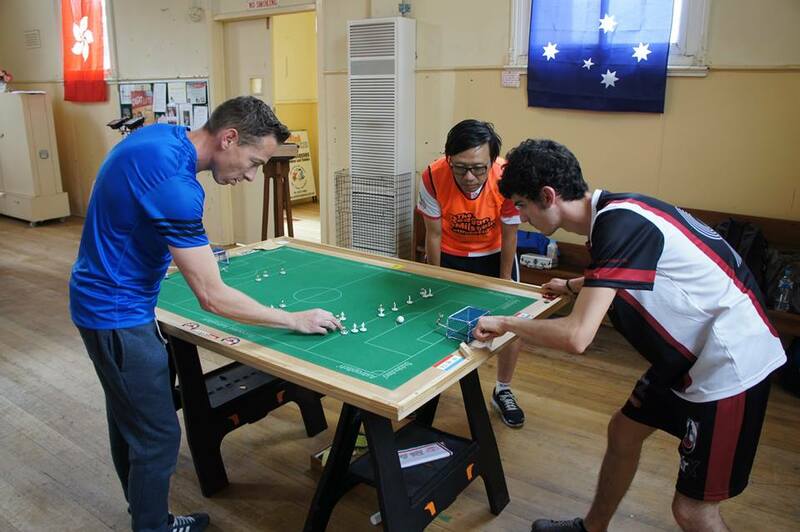 Fresh off his world cup experience, Raffele Lombardi shocked the hall by taking an early lead over Asian Cup champion Peter Thomas. This lead was held until only 1 minute from time as Peter nailed a long shot which produced his loudest goal celebration in Australia yet and sent the game to golden goal. No goals after a very tense extra time in which both players came very close to getting the winner, and so the match would go to a shootout. Peter held his nerve and won the shootout 3-1 with Raffaele no doubt feeling disappointed having come so close. A special mention must be made to the referee of this match- Giuseppe tardiota. The Semi-Finals were both quite one-sided affairs with the severely jet lagged Eliot Kennedy going down 3-0 to Peter Thomas and Fabrizio Coco going down 5-0 to Chris Thomas which meant the sibling showdown in the final would occur. Before the final I learned that Peter has only ever beaten Chris once, and unfortunately we were not able to witness another such result on Saturday. 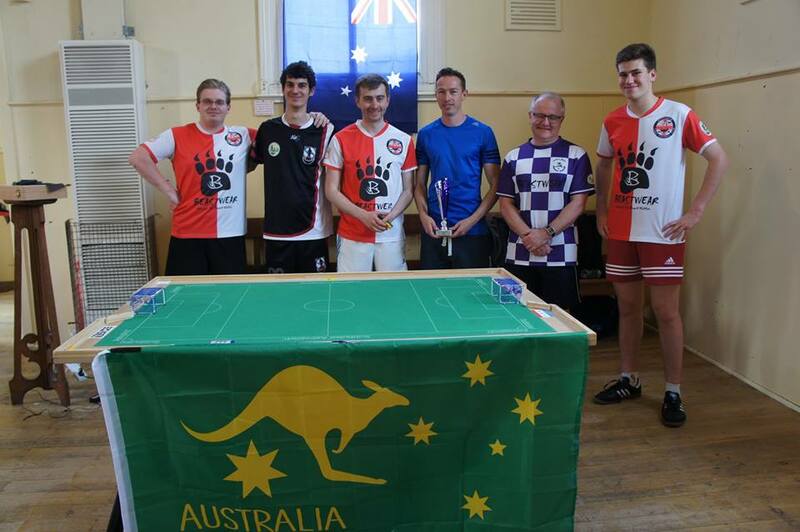 Instead, we witnessed a high quality match of Table football, combined with outstanding sportsmanship that saw Chris put 4 without reply past his younger brother to take out the International Open. Congratulations to Chris and thank you to all players for coming to Melbourne to participate, we hope to see you all again for the event next year. This entry was posted in News on 13/10/2015 by subbuteomelbourne.